Join our Arctic Triangle tour, starting at the Polar circle in Kangerlussuaq ending in the town of Icebergs, Ilulissat. You will sail from Sisimiut til Ilulissat and visit two of Greenlands UNESCO sites along the way. This trip starts in Kangerlussuaq by the Arctic Circle. Already on your first day in Greenland you will experience one of the most amazing sights as you join our half day trip to the inland ice cap. 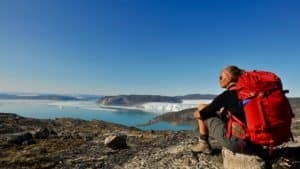 Back in Kangerlussuaq you spend one night before you will travel from Kangerlussuaq to Sisimiut for another night stay in one of the most charming towns in Greenland. 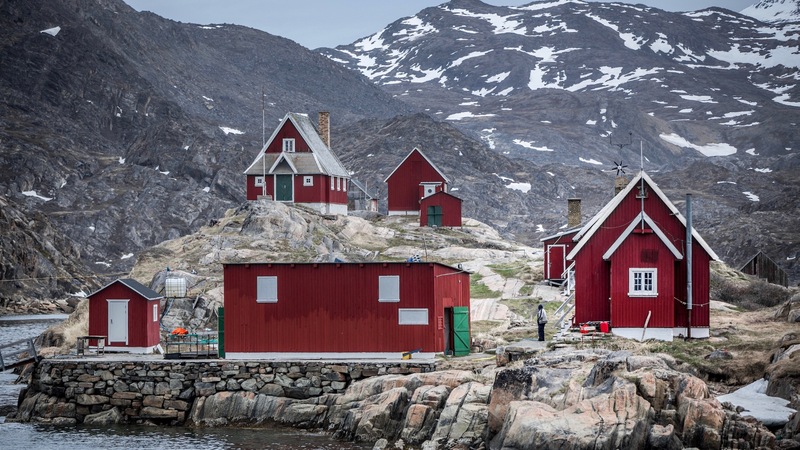 In Sisimiut you will vist an abandoned village and get to know the 2nd biggest town in Greneland just a little bit better before you continue north on board the local steamer AUL. Overnight on board will be in outside cabins with private facilities. 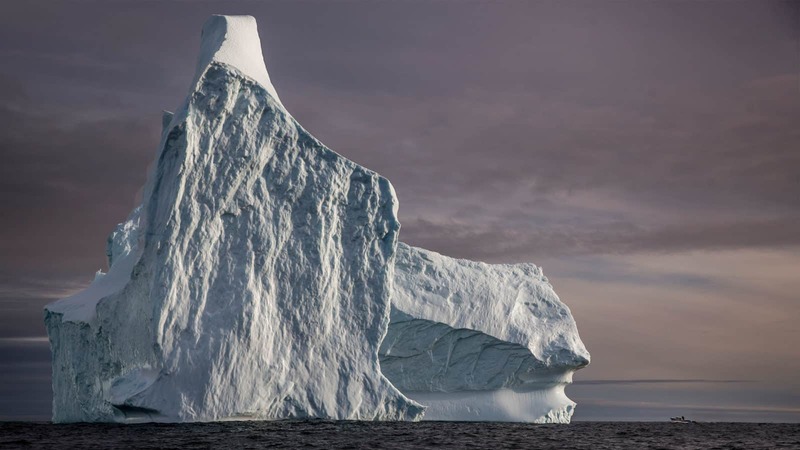 Already next afternoon you will arrive to Ilulissat, sailing through the amazing UNESCO ice fiord. 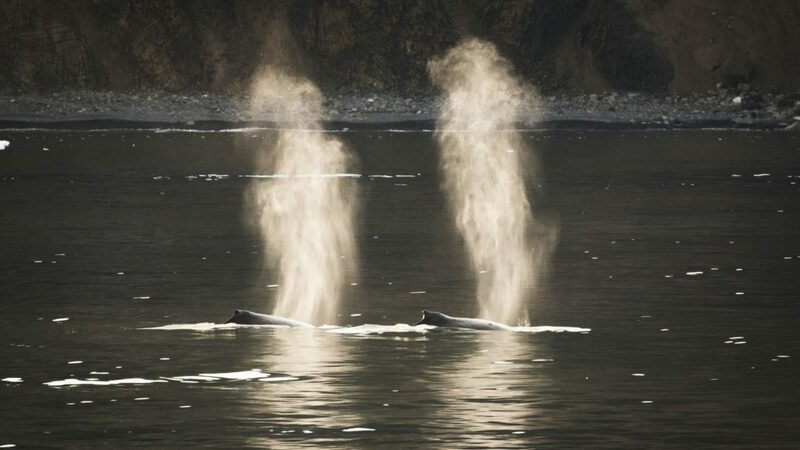 In Ilulissat you will have all the best selling tours to the UNESCO area included in your package. Departure from Copenhagen at 09:00 and arrival i Kangerlussuaq 09.50 local time. You will be met in the airport by your local guide, who will arrange transfer to your accommodation, Polar lodge/Old Camp. Early afternoon we embark on a journey to the famous Ice Cap, which has its beginning about 40km from Kangerlussuaq. 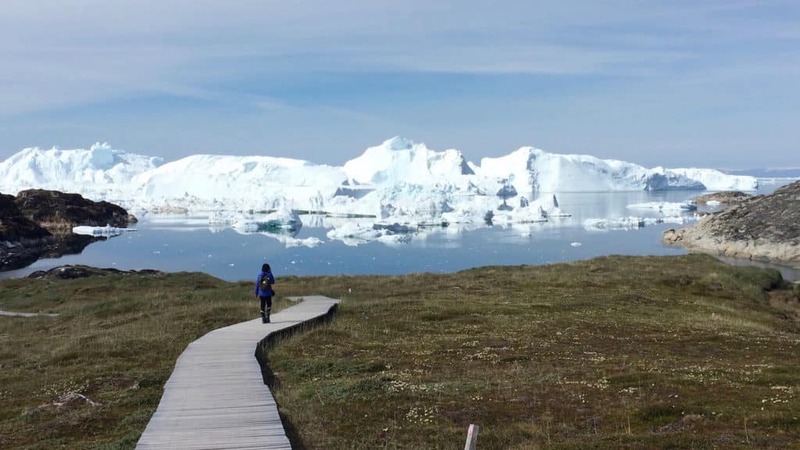 The trip takes you through the beautiful Greenlandic landscape, which has been formed by the movement of the ice sheet through out thousands of years. The mountains are rounded, and it’s easy to see the effects and strong forces of the ice. If weather permits, we will be able to walk up onto the ice cap itself. At its highest point, the Greenlandic Ice Cap is more than 3km thick! On the way there will be plenty of opportunities to spot wildlife; musk ox, raindeer, snowhare and the elusive snow fox. 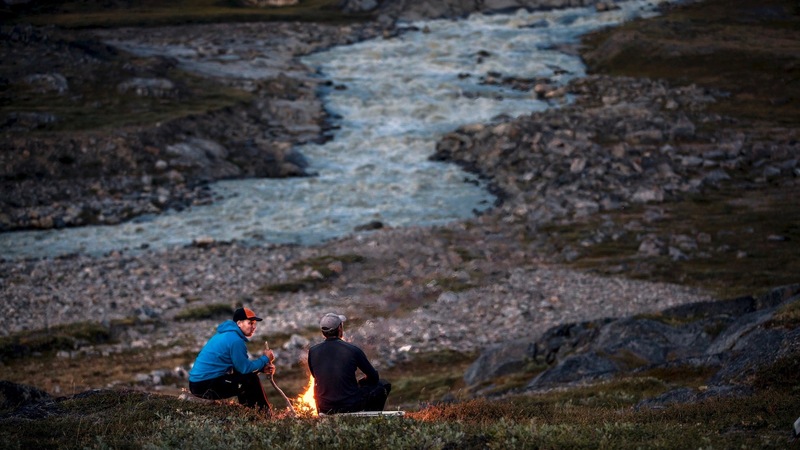 In the evening we recommend dinner at Restaurant Roklubben, which is located at the border of the very scenic Lake Ferguson, a short drive from Kangerlussuaq. Transfer to the restaurant is included. Breakfast at your lodge. Departure from Kangerlussuaq to Sisimiut with domestic flight during the morning. Hotel Sisimiut will pick you up in the airport and take you to the hotel. Here you will check-in to your room and get a briefing by your local host. During the afternoon you will have a city tour by bus included in your stay, followed by a 2 course welcome dinner at the hotel. Breakfast at your hotel, todays excursions will take you to the abandoned settlement Assagutaq 30min boat ride south of Sisimiut. You will get a guided tour of the small ghost village that is now only used as summer- and fishing camp. Visit the beautiful little church and enjoy the view and silence from town. Back in Sisimiut you will have time for dinner on your own before you will embark the local steamer AUL for your north going travel towards Ilulissat. Departure from Sisimiut at 21:00 in the evening. Check-in 30 minuttes before departure. Outside cabins with private facilities is included in the price. Enjoy a morning on board, as the coastal steamer visits the small town Aasiaat. 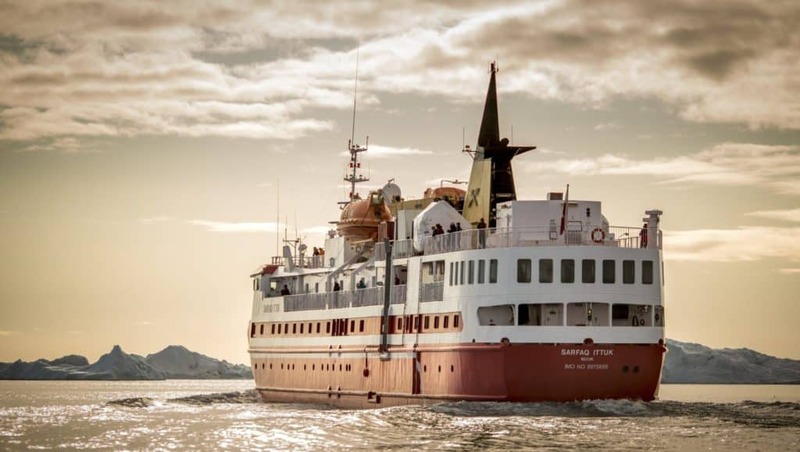 At 1pm you will arrive in Ilulissat, where Hotel Hvide Falks minibus will pick you up at pier. Transfer to the hotel for check-in. Same afternoon you will have a briefing and city walk with your local guide. Evening at leisure in Ilulissat. Dag 5, Monday: High lights of Ilulissat. After breakfast we will hike up and into the Sermermiut Valley, which probably will be one of the most beautiful hikes you will ever experience. It is not hard, it is not long, but the views over Kangia Ice fjord is a sight to behold! 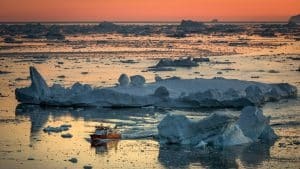 The place is on the UNESCO list of world heritage sites, and here you can experience, with your own eyes, the “emptying” of ice into the ocean from the Ice Cap. 10% of all ice coming from the Ice Cap, goes through this narrow straight. On our way to the fjord, we will come across very old Inuit settlements. We have lunch in town on our own. In the evening, it is time to experience the Ice Fiord. At slow speeds we will cruise through the waters littered with icebergs of all shapes and sizes. It gets cold at sea, so bring extra warm clothing. Use the layer system, so you can alway put on or take off another layer of clothes. Breakfast at the hotel. Today you can enjoy a day at leisure in ilulissat. We will be happy to help you arrange more optional excursions during your stay. 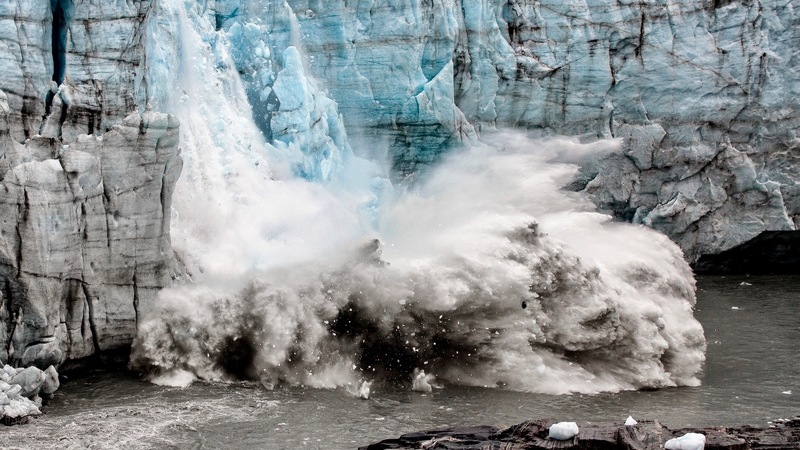 Add on a day trip by boat around the Diskobay on our explorer tour, or visit the Calving Glacier Eqi. Stay overnight in our wilderness hut or consider to add on a flight seeing tour by plane or helicopter – or book longer hikes and ice fishing as you please. Our guides on the spot will be happy to help you book any extra tours. You can also pre- book from home, as you wish. Breakfast at the Hotel. Transfer to the airport made på Hotel Hvide Falk. Departure via Kangerlussuaq. Expected arrival in Denmark at 20:00 or 21.30 same evening. 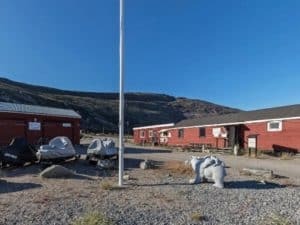 In Kangerlussuaq you stay in either Polar Lodge or Old Camp Old Camp is situated two kilometres from the entrance to the airport in a beautiful area in between Mount Hassel and Søndre Stømfjord (the fiord) with a view over Lake Ferguson and the mountains. The hostel consists of four wooden constructed long houses with 37 rooms shared between the three houses. In the fourth house, you find the reception and a small kiosk. The double rooms are furnished with beds, a desk, a chair, a wardrobe and a clock-radio. You will find modern shower facilities and toilets in the hall way in every building and eating and common room with a tv, DVD player and a stereo. Breakfast is included. It will be possible to stay in guesthouses or in hostels in most places in Greenland. 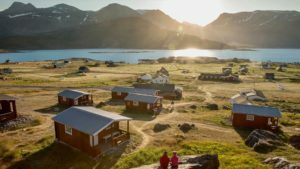 By choosing this form of accommodation you will get a cheaper price, than if you stay in hotels, and you will feel that you get a more authentic experience, when travel around in Greenland. Especially when you visit the small settlements. 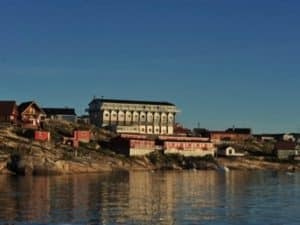 In Ilulissat, we are so lucky to own Ilulissat Guesthouse, which offers overnight stays with a homely setting - all with an amazing view over the Disko Bay. Do not hesitate to ask for more information regarding this form of accommodation, when you book your trip to Greenland. 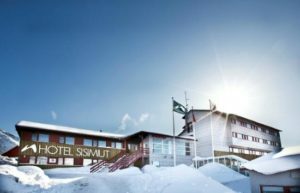 Hotel Sisimiut is your best option for a nice overnight stay in a cosy and well functioned hotel in Sisimiut. All rooms has private facilities, and the hotel also offer conference facilities, lounges and access to coffee and tea all day. At the Hotel you will also find the best restaurant in town and a tour desk that offers a great variety of tours and excursions in the Sisimiut area. Internet is available during your stay. 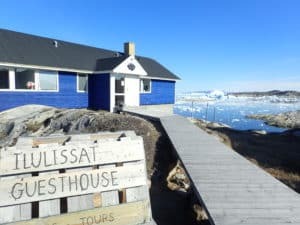 In Ilulissat Guesthouse is owned by Arctic Friend, and we are proud to invite you to stay in our small and cosy guesthouse, all located with amazing view of the ice fiord. Most of our houses has 3DBL rooms sharing toilet and shower facilities in the hall way. You will have full access to kitchen facilities for self cooking and you can enjoy your meal in our living room, while enjoying the view of the icebergs floating by. Apart from our guesthouses in town we also have a small wilderness cabin in Bredebugt. Contact us for further information.